If so, read no further. 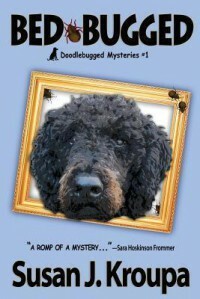 You'll love Bed-Bugged: a Doodlebug Mystery, so just buy it without delay. If so, you're going to love Bed-Bugged, but you might need more convincing. Why? Because you may never have read a mystery with a dog as detective. Or with a dog as detective narrator. Or especially with a bedbug sniffing dog as detective narrator. But that's exactly what Doodle, the Labradoodle, is. I enjoyed all the characters, but I couldn't help falling in love with Doodle and his owner's daughter, Molly. But in a way, I most loved watching a story from the low-down, smell-based point of view of a working dog. For me, a mystery reader and writer, it opened my mind to many new ways of observing a crime and its solution.